This Korean horror film is deeply creepy, truly horrific, totally unpredictable, shockingly raw and repeatedly unnerving. However it is also too often funny, perhaps not even intentionally so, and this kills any sense of the tension. This, unfortunately, is a fundamental flaw and the misjudged tone stops the film being the modern genre classic it could have been. It should have been Let the Right One In but in places it is too reminiscent of Abbot and Costello Meet Frankenstein. The main problem is all the screaming. It’s not that I think this is excessive but the last time I saw yelling that was so unrestrained was in those old comedy black and whites. Lou Costello, The Three Stooges, Oliver Hardy, all of them had a particular way of panicking that involved wide mouths and eyes, stumbling around and waving their arms in front of them. Do Wok Kwak, the lead actor here, regularly loses it in a very similar way throughout this film. The thing is, it is possible I wouldn’t have made this connection if they hadn’t already set the character up as a bumbling incompetent. I think the audience is supposed to find this part humorous but for me it was a misstep. The police officer is the lynchpin of the entire story but this is not the only respect in which he is a bit of a keystone cop. In not being able to take him seriously I couldn’t take the film seriously. Don’t even get me started on the shamen’s exorcism rituals. This is all such a shame because so much of the rest of the film is brilliant. The story involves a small mountain village in South Korea where some kind of sickness is causing people to turn to extreme ultra violence. People start to suspect that an old Japanese man who has recently moved to the area is voodooing the whole thing. The film is shot beautifully; the landscapes surrounding the village look stunning. In contrast aesthetically but filmed with as much attention to detail are the murders and the violence. There is plenty of clever editing, imagery and allegory and individual parts of it are genuinely terrifying. The suffering and despair of the victims feels real and the depictions of child possession are horrific (fourteen year old Kim Hwan-hee deserves copious awards). Also, at two and a half hours, the pacing is skilful and interest is easily maintained. Other makers of horror could learn much from what is on screen here. It is just, on occasion, a little silly. Not everyone is going to share my objections. Critically the film has been lauded and I would certainly recommend it to fans of the genre but for me there have been far scarier movies this year. Under the Shadow, The Witch and even The Conjuring 2 had me on the edge of my seat more. Do the female characters exist purely to define or motivate the men? No. Are the women believable as real people! Yes. There are a selection of significant females in the film even though three of them are most easily described in terms of their relationship to the male lead; the daughter, the wife, the mother in law. There is also an enigmatic young stranger who plays a key role. No! Don’t let them see it, even if they do enjoy Abbot and Costello movies. 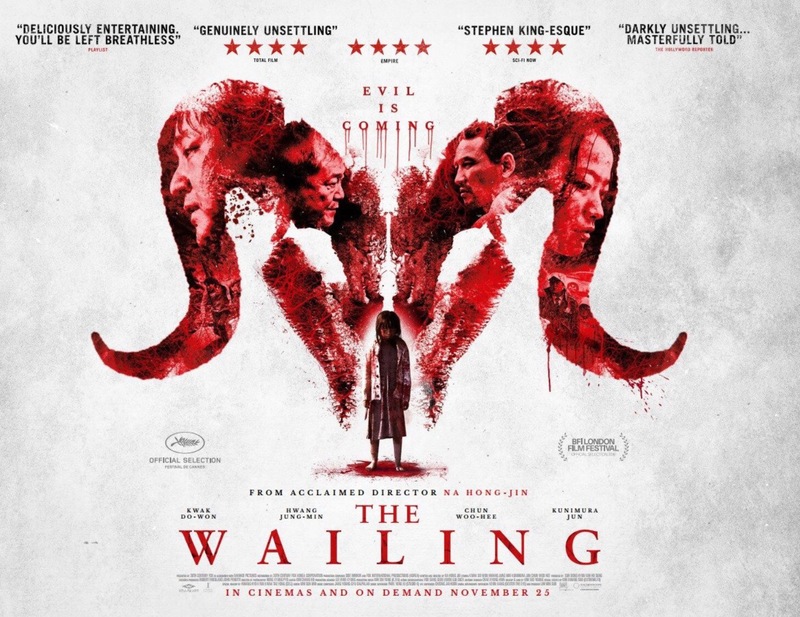 The Wailing is On Demand and in a very small number of cinemas.